JESS JEETLY, the founder of petite office wear brand Jeetly, shares tips on how to look smart and polished for work. What style tips would you give petite women on how to look chic and feel more confident in the workplace? Every woman should embrace her own style and we encourage women to wear what they feel most confident in, ensuring garments fit the business dress code. Nevertheless years of research by fashion designers and stylists have concluded that we petite women look our best when we follow the simple rules below. 1. Wear dresses in one colour where possible. It’s advised that petites match separates (tops, trousers and skirts) to form single colour outfits and avoid colour blocking which will shorten our frame. 2. Avoid large, busy printed fabrics – only buy clothing with small, delicate prints and stick to solid colours to avoid swamping your frame. 3. Make sure your wardrobe contains investment pieces in dark colours – black, navy, charcoal, burgundy. Not only do they make you look slimmer, they will mix and match with other items in your wardrobe and last you years. 4. Select clothes with vertical lines. Wear V-shape or U-shaped necklines in tops, dresses and shirts to elongate your figure. 5. Wear fitted garments – this doesn’t mean tight, just tailored, form-fitting, as baggy tops and dresses will make you look heavier and shorter. 6. Keep belts slim and match them to your outfit. Wide or contrasting coloured belts will cut your figure in half and break up the vertical illusion of height. 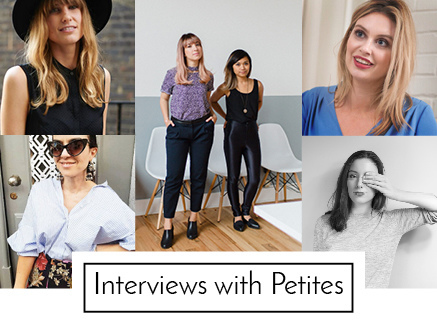 How can you tell if you need to buy petite clothes? Petite clothes tend to cater for women with short arms, narrow shoulders and short stature, so if you are standing 5’3 tall you will have to go for petite-sized dresses, skirts and trousers and can mix with regular-sized tops depending on the size of your shoulder or arms. If you measure up for at least two out of the four points above, you most definitely have a petite body frame and would need petite clothing. About Jeetly – Jeetly is a premium brand of work wear for petite women who are under 5’4 tall. Their mission is to fulfill the needs of petite women worldwide by giving them a functional wardrobe of corporate, classy, chic clothing, which caters to the needs of modern day work culture. Our focus is on timeless pieces in quality fabrics which can be worn from day to night and are interchangeable season to season.